Crab Lake Conservancy protects a scenic upland lake and the headwaters of Crab River. 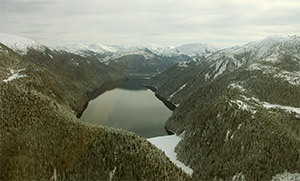 The conservancy represents some of the more spectacular characteristics found in the higher elevations of the Kitimat Ranges Ecosection, including massive rounded mountains of monolithic granite, a fringe of the higher elevation variant of the Coastal Western Hemlock zone that is characterized by old-growth conifer stands of western hemlock, western red cedar and amabilis fir, and forests representative of the Mountain Hemlock zone. Above the Mountain Hemlock zone, the Alpine Tundra zone begins where forested patches give way to intermittent patches of krummholz western hemlock, yellow cedar and subalpine fir in a matrix of heath and herb meadow communities. Crab Lake Conservancy contains a pristine lake, watershed, old-growth forests and wetlands in a remote and elevated setting near the Gardner Canal. It has a diversity of wildlife habitats and spectacular mountain scenery with high mountain peaks, glaciers, waterfalls, and smaller lakes and tarns. Access into this wilderness area can be difficult. Crab Lake Conservancy is only accessible by float plane or helicopter and is located approximately 50 kilometers south of Kitimat and 25 kilometers northeast of Hartley Bay.The lake is located about 4 kilometers inland and up the Crab River on the north side of Gardner Canal, east of Staniforth Point. Reference: 1:50,000 scale Topographic Map #103 H/10 (Devastation Channel). History: Crab Lake Conservancy was designated as a conservancy on July 14, 2006 following recommendations from the North Coast Land and Resource Management Plan. Cultural Heritage: The conservancy is in the asserted traditional territory of the Haisla First Nation. The Crab River area is important to the Haisla as it historically contained a village site that demarcated the traditional territories of two different tribes that are presently amalgamated as the Haisla First Nation. Use the below link for more information or to contact this First Nation. Conservation: The conservancy protects the undisturbed old-growth forests, wetlands, wildlife habitat and watershed of Crab Lake. Adventurous and experienced canoeists or kayakers may enjoy exploring Crab Lake if they can get their boats to the lake. There are opportunities for trout and char fishing in Crab Lake. Please consult the appropriate non-tidal fishing regulations for more information. Anyone fishing or angling in British Columbia must have an appropriate license. Waterfowl, bears, wolves, deer, mountain goats and furbearers may be seen in the conservancy. Firewood is not provided. If you must have a fire, please burn only dead and down wood, and be sure to fully extinguish the fire when done. Dead wood is an important habitat element for many plants and animals and it adds organic matter to the soil so please use it conservatively, if at all. We encourage visitors to conserve wood and protect the environment by minimizing the use of campfires by using camp stoves instead. Limited burning hours or campfire bans may be implemented during extremely hot weather conditions. There are winter camping opportunities in this conservancy but access may be a problem if the lake is frozen over.